The auto chain option enables you to automatically chain selected controls from the New Parameters dialog box. Chaining populates controls based on the selected value from the prior control in the chain. The auto chain option is useful, since it creates the chain or links of a chain, automatically. Note: Automatic chaining creates a basic chain with default functionality that does not include any conditions. You may create conditions for a chain through the Parameters tab. When importing or referencing a report with parameters to an HTML page, the controls are not chained by default. 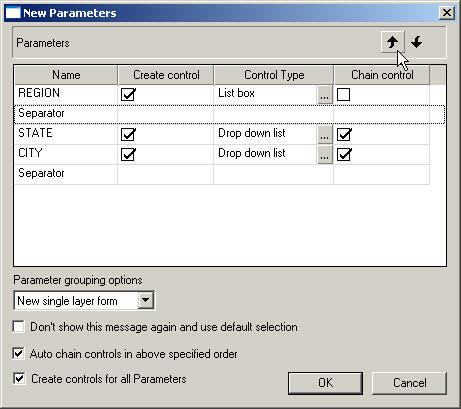 You may choose to include or exclude individual controls in a chain with the Chain control column from the New Parameters dialog box. Additionally, when the auto chain option is selected, a separator is added to the parameters list on the New Parameters dialog box. A separator is used to separate controls into multiple chains and can be moved up or down in the chain sequence. The auto chain option creates the chain, or links of a chain, automatically. When the auto chain option is selected, a separator is added to the parameters list. A separator is used to separate controls into multiple chains and can be moved up or down in the chain sequence. In HTML Composer, import or reference a report with parameters to an HTML page. The New Parameters dialog box opens. Select Auto chain controls in above specified order. Tip: You may use the up or down arrows to change the order of the selected control before selecting this option. 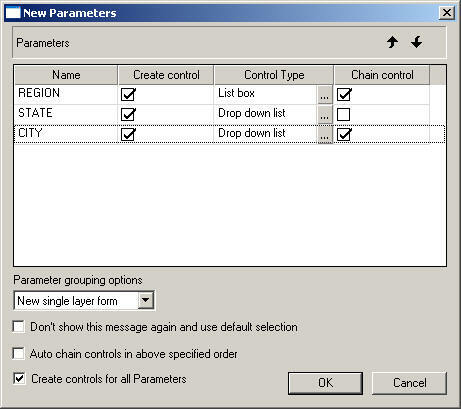 The Chain control option is selected for all controls and a separator is added as the last object to the list of parameters, as shown in the following image. To create multiple chains, click the separator row and use the up or down arrows to change the location of the separator in the chain. Note: If the default separator is moved up, another separator is added to the end of the list, as shown in the following image. Click OK to close the New Parameters dialog box and add the control to the HTML page. On the Design tab, when creating multiple chains from the New Parameters dialog box, each set of chained parameters appears on a new line, regardless of the grouping option selected from the New Parameters dialog box. This behavior is set through the Start each chain on a new line option, located on the Form Settings dialog box in HTML Composer. For example, the following image shows the first link in the chain (REGION) on one line. The second chain (ST and CITY) starts on a new line within the control of the Design tab. This enables you to see the relationship of the chains within the form. Start each chain on a new line is selected by default. On the Parameters tab, chains are represented by lines connecting control objects. For example, the selected value for the REGION field populates the available values for the STATE field. The selected value for the STATE field populates the available values for the CITY field in this chain. If additional filters are added, use the chaining buttons on the Positioning toolbar to add or remove the selected control to the current chain. The Chain control column enables you to include or exclude individual controls in a chain, from the New Parameters dialog box. Select the Chain control check box for the controls to be included in the chain. The controls are chained in the order that they appear on the New Parameters dialog box. You may use the up or down arrows to change the order of the selected control before chaining controls. Note: If a control is excluded from a chain, the chain automatically links only the selected controls. For example, the following image shows REGION and CITY as links in the chain. On the parameters tab, chains are represented by lines connecting control objects. For example, the selected value for the REGION field populates the available values for the CITY field in this chain. You can use the chaining buttons on the Positioning toolbar to add or remove a selected control to the current chain.